According to QCD, quarks possess one of three charges that allow them to pair in various combinations, such as mesons—elementary particles composed of one quark and its corresponding antiquark. Force carrier particles, known as gluons, hold the quarks together by exchanging and mediating the strong forc e, one of the four fundamental forces. This structure is the foundation of all matter in the universe, but much is still unknown about why QCD works the way it does. Currently, scientists are searching for the existence of mesons that don't fit the traditional patterns. If a meson is found to weigh more than expected, something else must be going on. After all, one plus one can't equal three. Scientists call these hypothetical particles exotic mesons and believe that gluons play an important role in their structure. Their existence has long been theorized, but exotic mesons have not yet been observed in the laboratory or predicted with precision from first principles. Robert Edwards, a researcher and senior staff member at the US Department of Energy's (DOE's) Jefferson Laboratory (JLab), hopes to change that. Edwards is the principal investigator for a group at the Oak Ridge Leadership Computing Facility (OLCF), a DOE Office of Science User Facility located at Oak Ridge National Laboratory. His team has been using the OLCF's Jaguar and Titan supercomputers for several years to map out different combinations of particles. Last year, they were awarded an Advanced Scientific Computing Research (ASCR) Leadership Computing Challenge (ALCC) allocation to run lattice quantum chromodynamics (LQCD) calculations that can accurately analyze the interactions between quarks and gluons in a vacuum across both space and time. "A way to think of this is like knocking a billiard ball across a hilly area to get from point A to point B. We repeat these calculations over several different instances of these hilly areas," Edwards said, noting that the hillsides represent fluctuations in the gluon field. "These are the different configurations of gluon fields, and those snapshots are what we generated in previous INCITE allocations running on Jaguar and Titan." The team's ALCC project focused on running quarks through the gluon field and analyzing how their position in space–time is affected by the different configurations. Because of the unique properties of QCD, the team can't take advantage of classical mathematical methods. "There are no other choices but to try to solve everything numerically. You write down the theory for the standard model of particle physics and say, 'OK, that's what we're going to put in the computer.' So they put space–time on the computer," said Jack Wells, Director of Science at the OLCF. "The idea is, here's space and time represented as a lattice, or grid, of points. In the limit that the grid size is large and the lattice spacing is small, we'll get the right answer." LQCD calculations use statistical sampling in much the same way that pollsters predict who will win an election. You don't have to survey every single person. You just have to have a large enough sample size to have confidence. The larger the sample, the better it reflects reality. Increasing the size of these snapshots has been the group's focus over the past few years. As a result, the lattices on which the gluons are represented mathematically have become very large. The team has finished its work on lattice sizes up to 403 ´ 256. That is 40 sites in each of the three space dimensions and 256 sites in the time direction for a total of 16 million sites. The researchers hope that this greater level of realism will allow them to be the first to predict exotic mesons from first principles. Their research will give greater insight into how quarks and gluons bind to form such states and increase our understanding of the fundamental strong force. Edwards' ALCC project wrapped up on June 30 with all proposed computational tasks achieved; the project used 350 million hours on Titan, the largest annual project usage of OLCF resources to date. An additional goal of the group has to been to give theoretical underpinnings to GlueX, a $50 million dollar nuclear physics photon detector in JLab's new Hall D.
Edwards said the GlueX detector will try to answer two fundamental questions experimentally. "One, do these [exotic] mesons even exist? That's just a basic question. And two, how would you actually find them experimentally? For that, you need to know how they decay, because they only exist for a short period of time." It has been difficult for researchers to observe these particles experimentally because they can't observe the individual pieces—quarks, antiquarks, and gluons—by themselves. Unlike the other fundamental forces, such as gravity, the strong force only increases with distance. If you try to pull elementary particles apart, the fields holding them together eventually snap, and another quark and antiquark pair is produced out of the vacuum. Because of this phenomenon, known as confinement, scientists have to look at the makeup of mesons and other elementary particles in a roundabout way. In an electron accelerator, photons are shot into a proton target. Edwards likens it to "thwacking a bell" that starts ringing and sending off vibrations, or resonances. When that resonance decays, it breaks down into other particles that are picked up by detectors like GlueX. The nuclear physicists at JLab then try to reverse engineer these particles to determine what was in the initial state. Edwards' team hopes to help better calibrate these physical experiments by determining the energy spectrum of exotic resonances as well as by predicting what the properties of these exotic mesons might be so JLab researchers have a better idea of where to look for them. "I don't like to use the 'B' word often," Edwards said, "but this ALCC allocation has allowed a breakthrough advance for us. Now, the race is on. GlueX is starting to take measurements and goes into full production in the fall." More information: Dudek, J. J., R. G. Edwards, and C. E. Thomas. "Energy Dependence of the ρ Resonance in ππ Elastic Scattering from Lattice QCD." Physical Review D 87 (2013): 034505. Dudek, J. J., R. G. Edwards, C. E. Thomas, and D. J. Wilson. 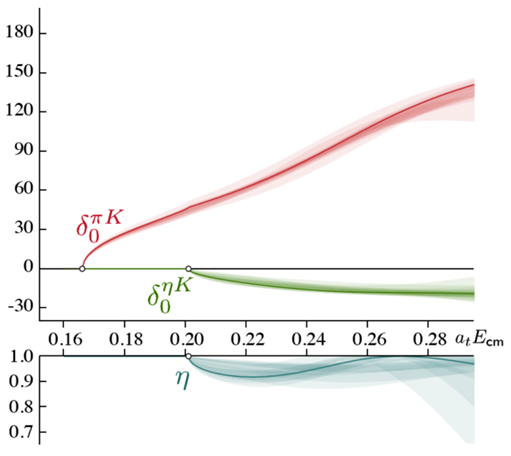 "Resonances in Coupled πK-ηK Scattering from Quantum Chromodynamics." Physical Review Letters 113 (2014): 182001. Wilson, D. J., J. J. Dudek, R. G. Edwards, and C. E. Thomas. "Resonances in Coupled πK,ηK Scattering from Lattice QCD." Physical Review D 91 (2015): 054008. Gee; C.T. maybe you ought to take a little more time when you write an article, maybe question the author more. There are two major misstakes in the first line. !. Quarks build all matter. No , ONLY protons and neutrons build all matter. If you could add a quark any time, you would see isotopes of 4,5 ,7 or 8 quarks. Other than the proton and neutron, ALL other matter adds 3 quarks at a time and that is adding another proton or neutron. So all other isotopes are built from protons and neutrons. .
2. No QCD does not explain. It's not right and not even close. Now this is a long story, so I'll just give one evample. Take Be 9 and B 9, (you ofcourse can look all this up for yourselve, don't take my word.) Both have 27 quarks. The difference is one quark has either a plus or negative charge. This change has nothing to do with color. What ever QCD states, it states the same for both particles, ONLY one charge is different. One isotope is stable, the other is highly unstable. In fact the greatest change in all 3000 isitopes. All because of ONE charge change. This is explained by assuming all protons and neutrons are on a plane and all additional protons and neutrons are on the same plane or parallel plaines or right angle plains AND all quarks and plains are at FIXED disstances. This very case is then explained using this model. These structure are much like bricks, Be 8 is very stable and we are trying to add one more to either end. Boy, I am sorry. I was wrong in only 5 days. You can , ofcourse add a two quark system. And these do exist. They must lie on the plain. But, for me, as of yet I am not sure how the antiquark interacts with the other quarks in the system. Pretty much fun to find something so new when I was sure that couldn't happen. Maybe you can find it for yourself. Maybe I can tell you in a couple of days, hopefully.